Custom made antennas. 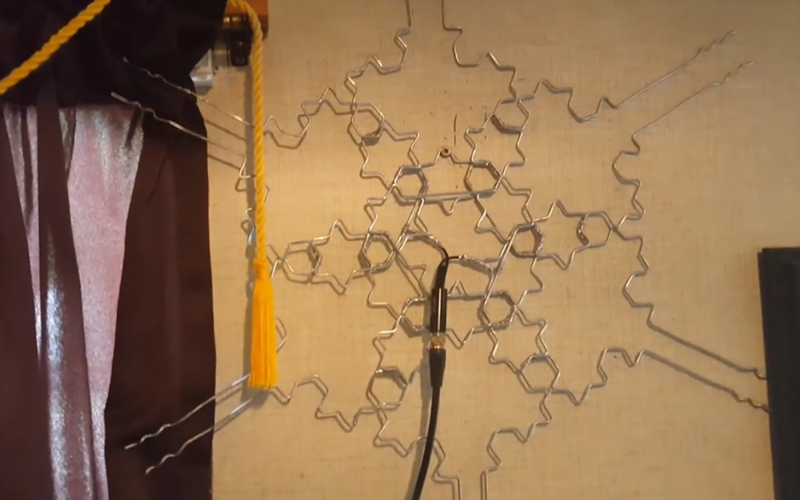 An Elvis Antenna, a Keith Richards Antenna, an Eric Clapton Antenna… Tuning an antenna. It can also be used by sun worshippers. But seriously it is one heck of an antenna having built one for fun. It is made from 6 coat hangers twisted into a fractal pattern. Fractal antennas are also used in cell phones. Gave it to my sister. She laminated it with gold spray. Works great to this day after a year. I got the Antop AT-400BV. With my limited technical knowledge, I purchased it because of it’s aesthetic and looks. Turned out to be one of the best ill-informed decisions I’ve made. I had originally intended to use it inside, so I wanted something that would look nice (It comes with a pedestal stand). I didn’t ask the HOA for permission, I informed them after having hoisted it up. They were probably expecting something completely different, but interposed no objection after seeing it. I had no idea how good this antenna was, the results have been sterling! ALSO … I never pay much attention to the stated range & specs on antennas, as I feel they are all exaggerated claims. This one made a believer out of me, I’m pulling in over 50 stations with clarity! Where are the VHF rods? When I was young I knew kids that would probably use that for target practice. Most new antennas aren’t tuned properly for VHF. It’s cheaper to add an amplifier even though it isn’t as effective. The Antop has a plug-in option for a VHF element. Plus there are several models that come with the VHF element. Their web page has all the models available - amplified and unamplified. 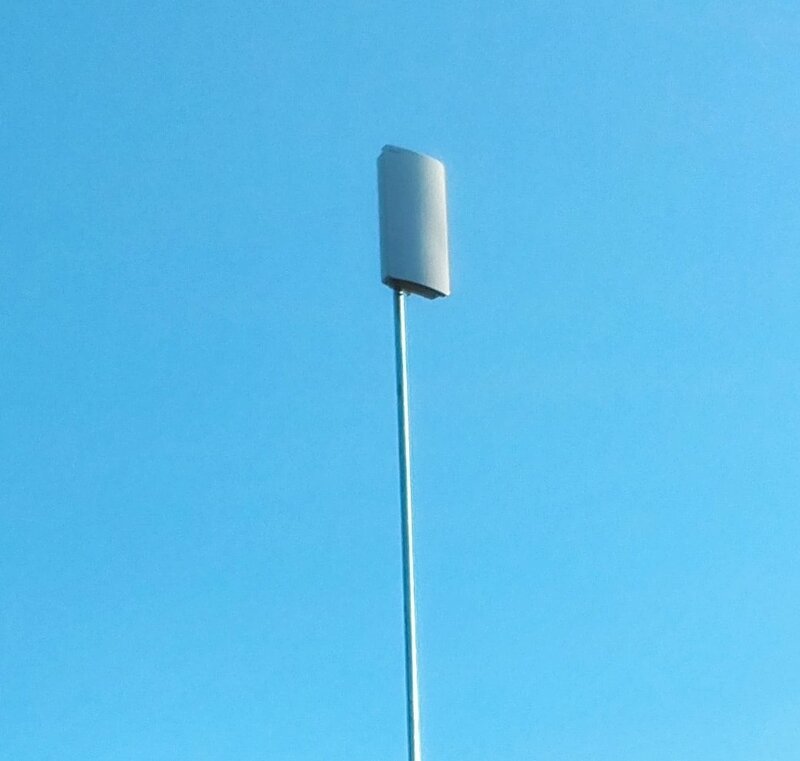 One of my friends also has this antenna and it is a great performer. It’s gotten good reviews at Digitalhome.ca and elsewhere. We’ve taken one apart and it’s a “slotted waveguide” design. The company that manufactures them has distributers that rebrand it under different names. Antop’s preamp for just $16 is pretty good as well. I didn’t insert them before going up on the roof. I was pulling in all stations possible without them, so felt I’d be going past the point of diminishing returns with them. I’ve gone through summer and winter seasons (now starting spring) without any difference in stations received (nor in quality of signal). You’re right about the target practice thing, that thought had occurred to me. I noticed on your youtube page, people asking you to build one, offering to pay for them. After my sister laminated it with gold spray (gold is a great conductor), she put a crystal in the middle. I thought you meant a gold color spray. Does the actual spray contain gold? EDIT:. I really think you would have to use a process like electroplating to gain any actual conductance. I don’t think she had conductance in mind. Supposedly this spray had particles of gold inside - but who knows. She got that nice golden sheen with a sparkling crystal in the center. She calls it her Pinterest antenna because the gals on Pinterest would love it. Now she wants a few more so she can decorate them for specific holidays. Like a green one for St. Paddy’s Day. Red, white and blue for July 4th. I said NO my hands hurt from making just one with pliers. Now she wants a few more so she can decorate them for specific holidays. Like a green one for St. Paddy’s Day. Red, white and blue for July 4th. The AT-400BV has a VHF Dipole Pair that screw into the sides of the AT-400. Works great in Indianapolis, where at least 2 of the major network stations (CBS and NBC) broadcast on VHF-Hi band. Interestingly, the stated Freq. range of the 400BV starts at 47 MHz. This tells me that it should work great for FM broadcasts, too (assuming the amplifier doesn’t have an “FM Trap” in it). I was just at the antopusa.com website. They have a new amplifier ($30), that has adjustable gain, and a built-in two-way splitter (great for running over to a TV tuner directly, or an FM receiver, etc.). Looks pretty nice. Says the gain is 14 dB, with an adjustment of 0-10 dB. I’m not sure if that means that you end up with 14 - 24 dB, or 4 - 14 dB, though. I would guess the former. That’s their new distribution amp - Smartboost. The preamp (Smartpass) is 16 db (just a little higher than the distribution one). Their new AT-800SBS antenna uses the Smartboost instead of the Smartpass (used by the 400 series antennas) for two connections at the antenna itself. My preference would be the 400 series with Smartpass and put in a distribution amp later down the line. Rather than have two connections coming down from the antenna - I’d prefer just one cable. That’s a nice antenna you got! That’s exactly what I have decided to do (get a downstream multi-output distro-amp). I figure if I have any overload problems (not likely), I can just get a few assorted Coax Attenuators and experiment until I like the overall gain-structure. I started adding up outputs, and decided I’d better go with an 8-port unit (haven’t quite decided which one yet, though. Suggestions?). That way, I can bring the OTA signal in direct to each TV (as well as to the Tablo Quad), for greater flexibility, and still have enough outputs left over to bring FM to my AV Receiver, too, without having to mess around with lossy passive splitters. Channel Master 3418 (8 port). I use the the 4 port CM 3414. The CMs are among the best. I know Channel Master has been making “Antenna Stuff” since I was a baby (I’m 62 now). Actually, since BEFORE I was a baby (they say since 1949). Bet they’re happy about “cord cutting”, LOL! What does it mean “Power Inserter not included” on the Amazon listing? When it says it is +4 dB(v)? gain, but then the input says “-10.5 dB”, does that mean that the overall end-to-end gain is +4 dB on each port (including the -10.5 dB “attenuator” on the input), or what? Why do they attenuate the input like that? to avoid overloading the internal amp in the CM-3418, or what? Also, is the CM-3418 simply a single-output amp with a built-in 8-output Splitter, or is it more sophisticated than that? In other words, would I get more flexibility/signal-quality out of a single-output ADJUSTABLE amp with a downstream 8-output Passive Splitter? The way the gain goes down as the number of inputs goes up makes me feel like it is simply an internal passive splitter hooked to a single amplifier. Also, I can’t find a noise-figure for the Channel Master amp ANYWHERE. Got any ideas? A “power adapter” is included rather than a “power inserter.” The power adapter can supply more amperage than a power inserter which an 8 port needs (as opposed to the 2\4 models). Means also the unit has to be close to an electrical outlet. The gain is +4 db on each port. A normal unamplified 8 port splitter would lose 10.5 db on each leg - that’s what’s being referred to. The 2 db noise factor will not cut into the SNR by that amount. It will barely touch the SNR. If your preamp has a 1 to 2 db NF plus the CM’s NF, that is still way below the tuner’s NF floor. Channel Master is now a Chinese owned company - no longer the North Carolina based company they used to be. They’ve also branched out into other devices such as a DVR.